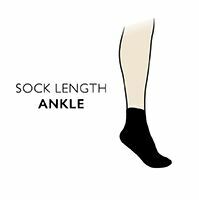 A short ankle sports sock to keep your feet fresh, dry and blister-free, men's and ladies 1000 Mile Ultimate Tactel Anklet Socks have an extra soft inner layer designed to wick away moisture from the skin. Tactel’s combination of fibres along with top of the foot mesh venting, helps to maintain a comfortable temperature, with arch bracing offering additional support. The twin layer (cotton rich outer, Tactel inner) action eliminates the friction caused between foot and shoe, helping prevent blisters, while ‘Y’ shaping and ‘Heel Power’ fabric technology keeps the socks firmly in place. Arch bracing provides important mid-foot support, an 1000 Mile add a flat hand linked toes for smooth seams that prevent rubbing. 1000 Mile Ultimate Tactel Anklet Socks are made in the EU, and the company offers satisfaction reassurance with a ‘blister free’ guarantee.